Undoubtedly, the nubia Z17 mini was the star of the show for ZTE's sub-brand at its event which took place earlier today. However, the smartphone wasn't the only product which became official on that occasion. 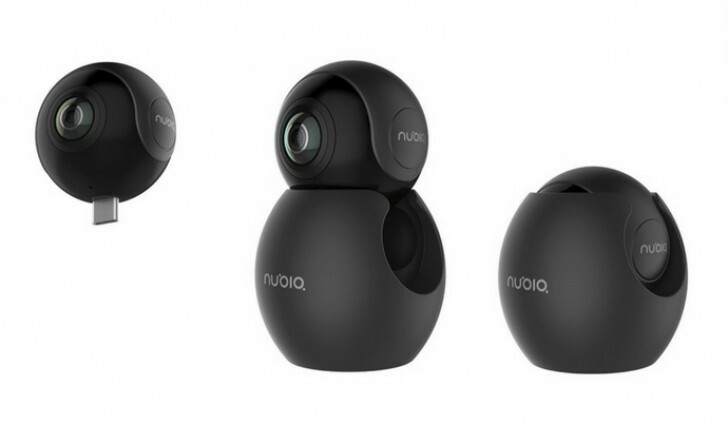 ZTE also announced the nubia NeoAir VR camera. This is a small device that boasts two fisheye lenses, each with a 210-degree field of view. The NeoAir creates 360-degree photos (at 3,008x1,504 resolution) and videos (shot in 2,560x1,280). Both of its sensors have f/2.4 aperture. The NeoAir VR weighs just 26.5g, and it measures 37.6mm in diameter. It has a USB Type-C connector, and you can plug it directly into an Android smartphone that has the new reversible port. If you go this route, you're able to broadcast your 360-degree videos live on Facebook, Twitter, and YouTube. The phone needs to have at least 2GB of RAM though, as well as USB OTG support. The nubia NeoAir VR camera is priced at CNY 699, which means about $101 or €95 at the current exchange rates. There are currently no plans to launch it in any other markets unfortunately. Why do they call it VR and not 360? Here I am all excited thinking this will bring 3D VR video recording to the masses. Don't play with my feelings that way!